Since Beyoncé published pictures of her and her hubby Jay Z’s 22 day vegan challenge just before Christmas veganism has seen a rise in popularity. Apparently she enjoyed it so much that she has started it again. It would appear she isn’t alone either, with more and more people wanting to try either going vegan or vegetarian for a couple of days a week. Campaigns such as Meat Free Monday have taken off after research showed that having a vegetarian diet at least one day a week comes with health benefits. Eager to feel these health benefits after a pretty extravagant weekend in London (which put significant stress on my back balance as well!) I decided to try out some vegan recipes. I could never be vegetarian – I love meat too much – so for me it wasn’t an ethical change, it was purely to see if the health benefits the expert’s claim you feel are true. It was a lot easier to avoid meat than I thought, especially at tea time. Dinner time was when I struggled though as I usually have salads so at first it was quite tricky to give up my favourite salmon salads and Nando’s chicken. But I stocked up on tofu and made a really tasty broad bean, bean sprout, cucumber and spring onion salad which was very tasty. After a week I did start to feel the benefits which I was surprised at. I felt full of energy and generally less sluggish on a morning which was great and I found that I hadn’t really missed red meat all that much. Plus, I saved money from not buying chicken as well which was an added bonus. 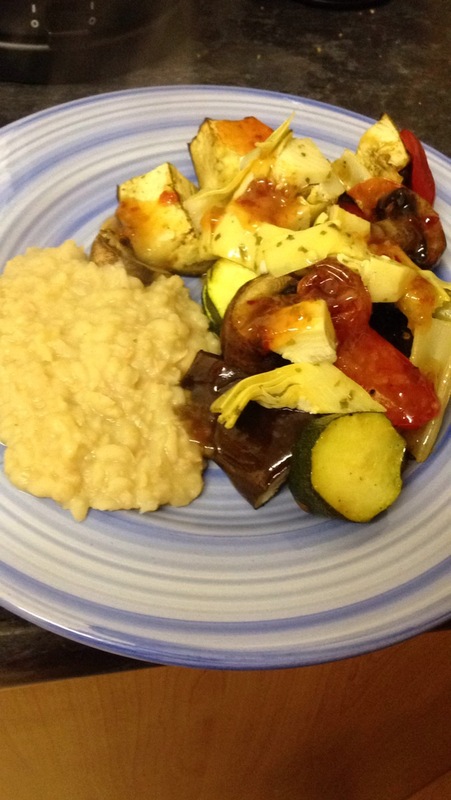 The first is Mediterranean veg and bean mash. Whilst the vegetables are roasting, boil a tin of haricot beans in some vegetable stock with the garlic and simmer for about 10 minutes. When it starts to thicken, take the beans off the heat and mash until you’ve got a consistency you like and voila – a simple, really tasty and surprisingly filling tea. 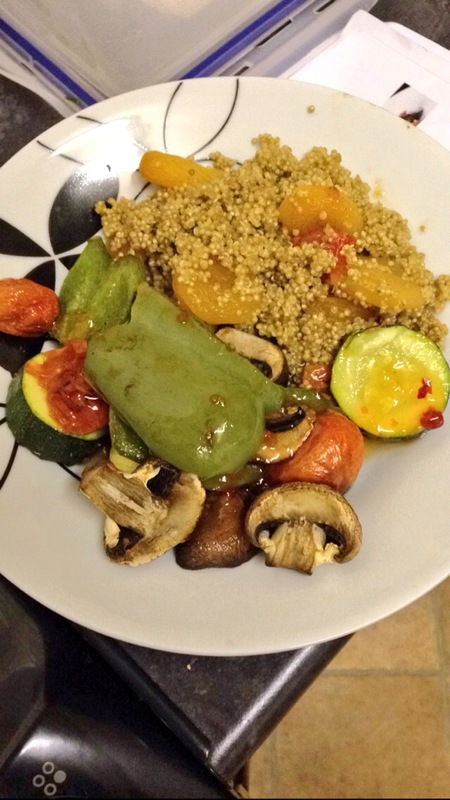 The second was my favourite of the week – apricot and orange baked quinoa with roasted vegetables. See above for the roasted veggies recipe, but you can add whatever you want to roast and whatever flavouring you fancy. I’m a big fan of quinoa (or keen-wa as my flatmate recently told me it was pronounced) but I had never baked it before. Add the quinoa to a casserole dish with the juice of one orange, fresh apricots and vegetable stock. Cover with foil and bake for 20 minutes, stirring once in between. And there you have it – two really simple, tasty and healthy meals made in less than 30 minutes. I liked the results and the new tasty dishes I had tried so much that I’m trying out more this week. I’ll post my new recipes as the week goes on. If you’ve got any vegan/vegetarian recipes you think I should try let me know.